HOLISHIP responds to urgent needs of the European maritime industry by developing innovative, holistic ship design optimisation methods, in which all main design functional requirements, constraints and performance indicators are considered. This includes building, operational and transport cost, life-cycle cost, environmental impact and potential loss of lives for passenger ships; all main technical and regulatory constraints are being considered at an early design stage, while accounting for the complexity of systems. The result will be the HOLISHIP integrated design software platform for the entire life-cycle of the maritime product under consideration, enabling also virtual testing and demonstration of the product. Reduce the duration of the design process (lead time), improve the designs and satisfy customer needs by optimisation through exploration of an enlarged design space, while controlling the associated costs and risks. Optimise the production process in terms of cost and duration. Optimise vessel operations and associated cost for varying loading and environmental conditions. Reduce the number, duration and cost of interventions and optimise the health monitoring of the vessels. For the End-of-Life Phase of maritime products, advanced design systems will further ease the dismantling and the re-use of recyclable materials and components, which will of benefit for the marine and aerial environment, owners and involved industry. To do so, HOLISHIP assembles a team of European leaders from the maritime industry, research and academia to perform the planned developments. The blend of skills and expertise of different industries, large yards and equipment manufacturers as well as SME operations, will assure a fully targeted approach to meet the requirements of the European maritime industry. Develop Software (s/w) tools for multi-objective and multi-disciplinary holistic system optimisation and integration to design ships and offshore structures for life-cycle operation. Develop and test a Virtual Vessel Framework (VVF) to be used in the optimisation of ship operation and concept validation studies resulting in more efficient and safe ships. Improve ship design through improved operational feedback from complex ship systems into the design loop. 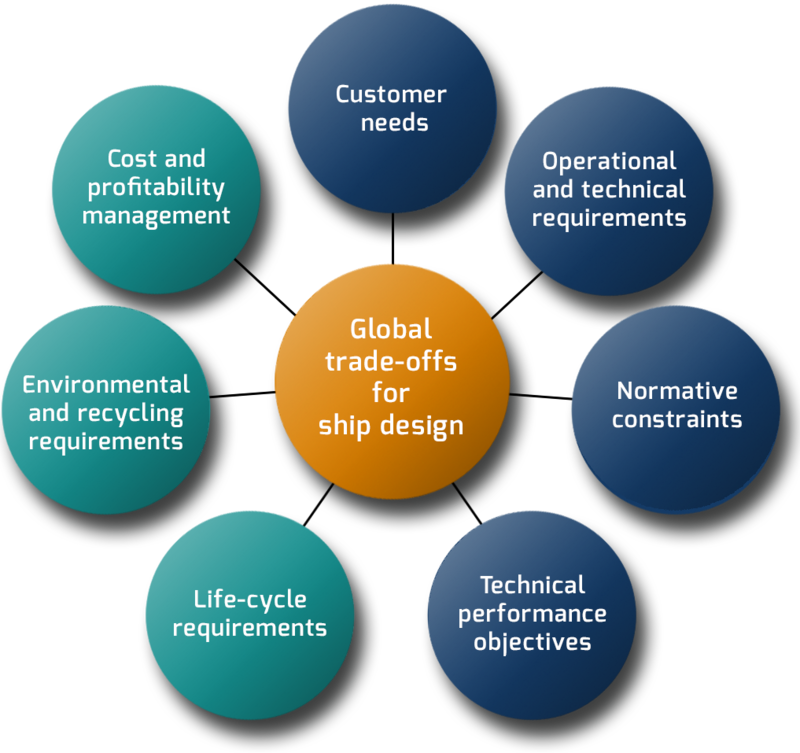 Achieve measureable life-cycle cost reductions through innovative holistic ship design and demonstrate this for typical European maritime industry applications. Reduce ship development time and costs through innovative design optimisation and integration of software procedures. Demonstrate methods to find optimal and innovative ship configurations according to measurable technical performances and ship´s operational performance indicators. Proceed to the full exploitation of the VVF after completion of the project to ensure continued use by the European maritime industry and improvements of the VVF. Disseminate and exploit the results gained from the project for the benefit of the European maritime industry, the university education and training of young and other professionals (CPT). Framework of methods and an integrated software platform for the multi-objective, multi-disciplinary and multi-fidelity optimisation of ship design and ship operation, coupling existing and novel design software tools to improve ship design and operation while reducing the design and development time. Library of multi-fidelity models and software tools for application in design optimisation or in simulated virtual vessel operation. Virtual Vessel Framework for embedded ship simulation. A series of eight (8) Application Cases with associated Digital Mock-Ups (DMU), demonstrating the HOLISHIP design approach and for exploitation by the HOLISHIP industrial end users.